Bio: No bio due to new multilingual packaging. 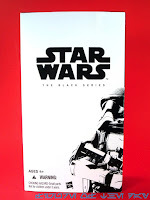 Commentary: A little history - I was pretty young when Star Wars died as a toy line. 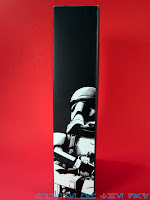 I only saw Luke in Stormtrooper Disguise and Han Solo in Carbonite once or twice as a child, so I didn't get a chance to buy them - and there were a few years where, because of no internet and no magazines and no books, that I wasn't sure they really existed. 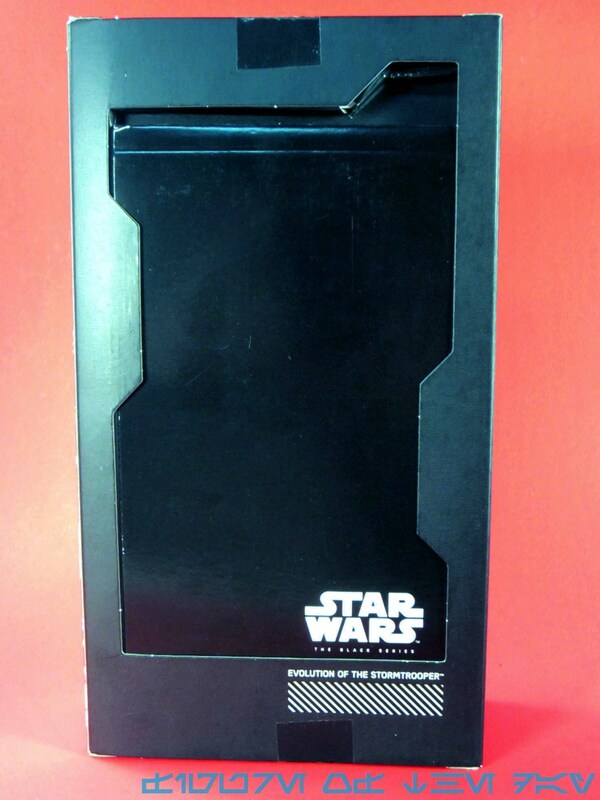 I looked around a lot, and as soon as I found evidence on a cardback at an antique show I made it my goal to get the frozen Han Solo - as such, that first "get" at the princely sum of $15 in 1990 was a huge deal, just like getting the 1996 remake and the 2006 remake were milestones for me. 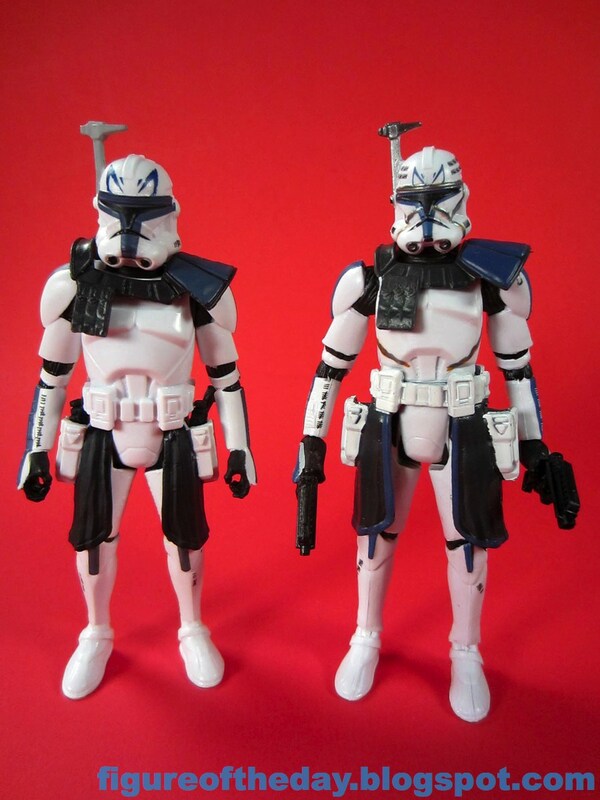 Kenner (and Hasbro) have been good about making about one carded version of this figure every 10 years, give or take a year - this decade's version is no slouch. It's a little weird, but you know, binders. They don't usually work right. As a kid, I found this figure as fascinating as my parents found it disturbing. Irvin Kershner's design direction resulted in a frozen moment in time taking the physical form of a space sarcophagus. This rectangular coffin was an electronic, 1980s, colorless update of one of the most famous artifacts in Egypt and served as sort of Schrodinger's Smuggler. Was Han alive or dead? We were told he was alive, but we couldn't be sure until someone opened it years later. That's a hell of a powerful cliffhanger, and the "frozen" toy with a Han inside was kept from fans for years after he thawed out. 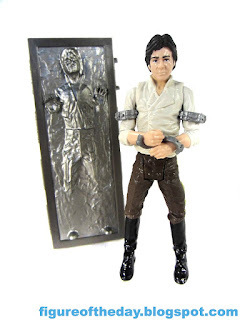 To date, they've all been fascinating figures - the first was clear so you could see Han inside as it "melted." The second had a waist clip to keep Han inside, balanced perfectly so the block would stand freely on a table without support. The third had a clear red face, as if it were just switched on right in front of our eyes. 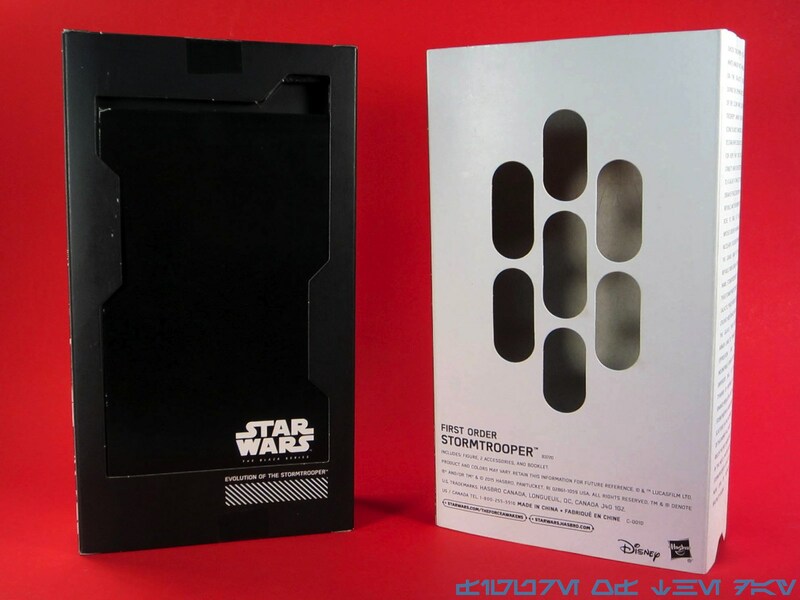 This one is unique in that it's the first one explicitly designed to be from The Empire Strikes Back with a fully-frozen silver block, Han's cuffs, and no weapons from Jabba's palace. It's also worth noting that his collar matches the movie and its pose more closely matches the Carbonite block than other releases - an impressive slathering of vaseline over the lens of reality. 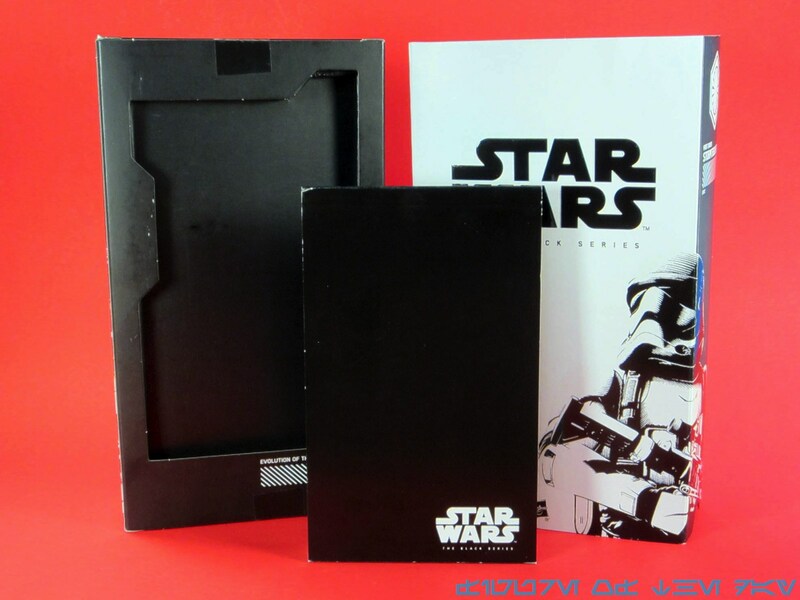 The block itself is molded in grey with silver paint on the face and the button panels on the side. A few of the individual buttons are painted black and blue, too, which is really nice and a lot better than stickers. While hollow, this block commits the one great sin - you can't open it and lock Han inside. This has been one of my big complaints since the first figure I got when I was much shorter, you could never actually close the block that Han comes with over the figure. There's not much I can do about it, but it always bugged me from the perspective of a toy. The Han figure seems to be all new construction with 14 points of articulation. It also goes to show that articulation won't get you everything - how the joints are cut, and how the accessories are designed, these things matter too. By itself, this is a great Han Solo figure. He has swivel arms at the sleeve, the elbows are pretty good, and the ball-jointed ankles make me think this figure could have been designed a few years before its release. 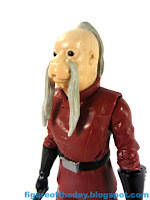 Everything is where it should be, with ample wrinkles and the ability to pose him as a little less assured, a little more roughed up than his usual appearances as a toy. Hasbro did a good job posing his shirt collar so it matches the gaffe sculpt on the actual block, which is most appreciated - it serves both masters nicely. As accessories go, I'm a big advocate of throwing them out if they don't work right. It's not worth spending the money if they aren't any good, and in this case they're not as good as they should be. The wrist binders are dang near impossible to get on both wrists, although it is possible to photograph the figure to make it look like they fit well. The arm ones are weird, with big open gaps in the back that stretch out funny. Of the two they're better, but they're still not great. I appreciate that they were included for the first time ever in a 3 3/4-inch action figure, but the set just doesn't quite work right. 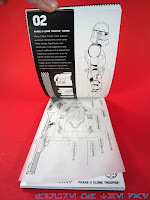 Interestingly, Hasbro's design for the arms works better than the wrists - it provides a better illusion of being bound. The wrist cuffs are going to be open on one side, regardless. More of an "m" shape would have worked better. I do not expect to see a new "toy" version of this. An ice mold with a "melting" feature, or a red LED bulb, will probably never come thanks to action features costing money and prices going up. It's easily the best "collector" version of this figure yet, and even if you have the previous versions this one offers enough new and interesting to be worth your while. 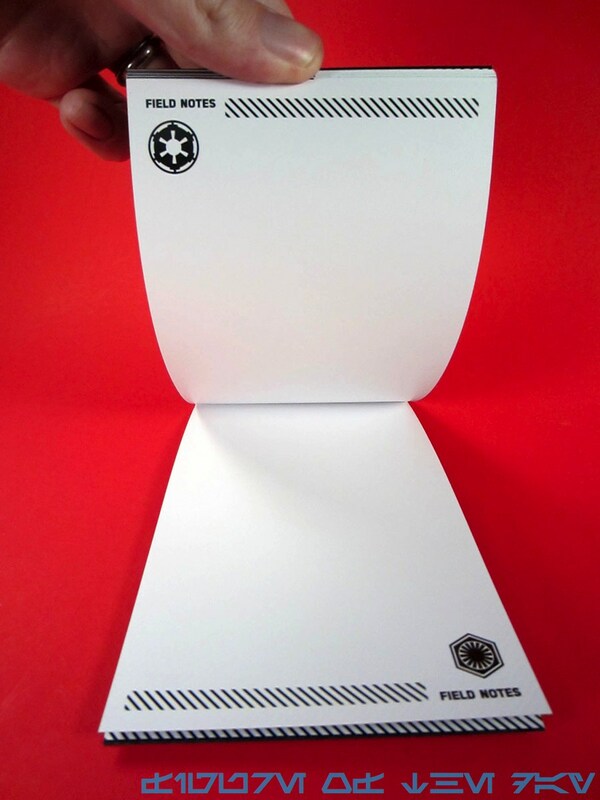 Collector's Notes: I got this online - you can probably score one for $13-$15. I've seen it in stores, too. 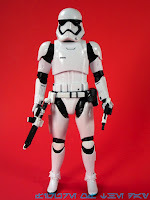 Commentary: When it comes to "just different enough to make you mad" figures, my preference is for them to be troopers. 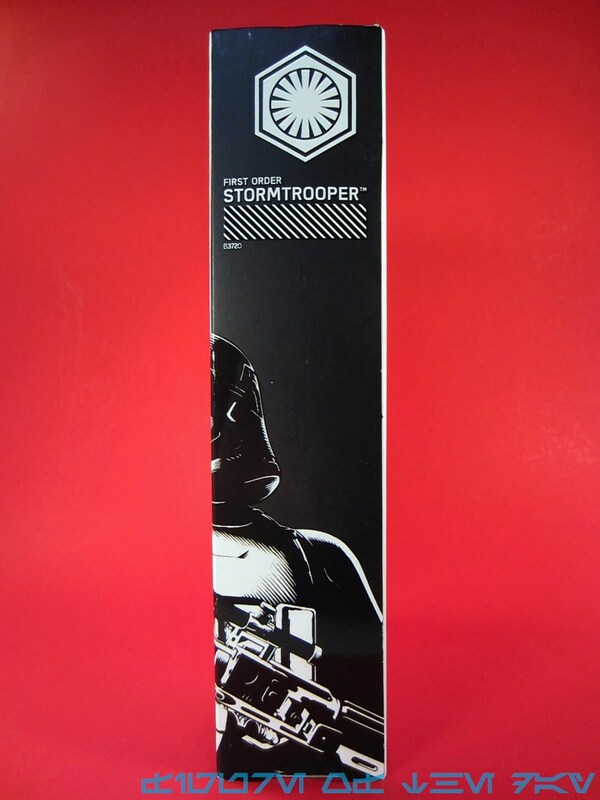 This Stormtrooper is it. It's the Black Series figure from earlier - which is basically the Dewback Sandtrooper from a few years ago - with a different (arguably better) helmet. 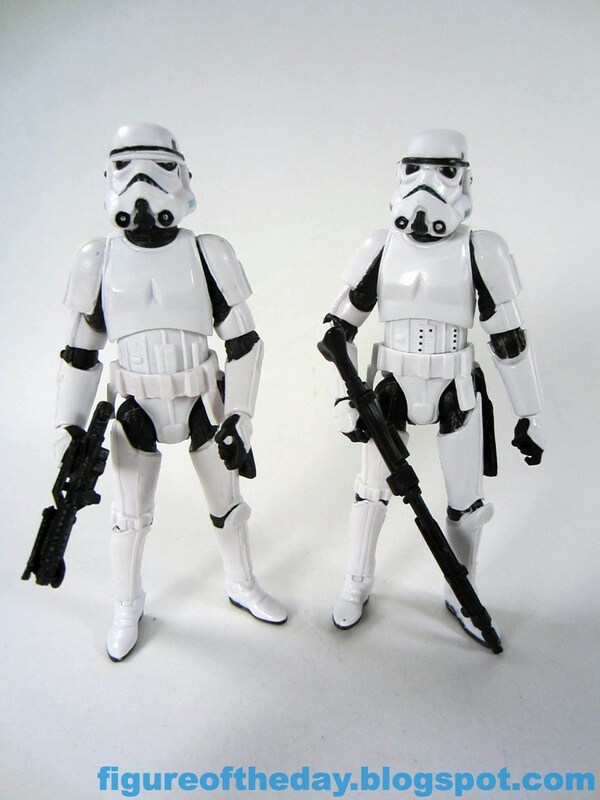 The good news is that it's an improvement, but you'll notice elements of the old Sandtrooper are still present like the slot to plug in a backpack. His body is also slightly different, as now it has painted black dots on the belly under his chest armor. That's a big plus, too. 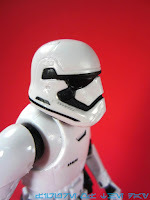 If the different helmet wasn't enough - it should be - it's not like you couldn't use a few more Stormtroopers anyway... unless the reality of no Death Star after 20 years, or a Star Destroyer, or any playset to actually use with all those armies you wasted thousands of hours and dollars tracking down. 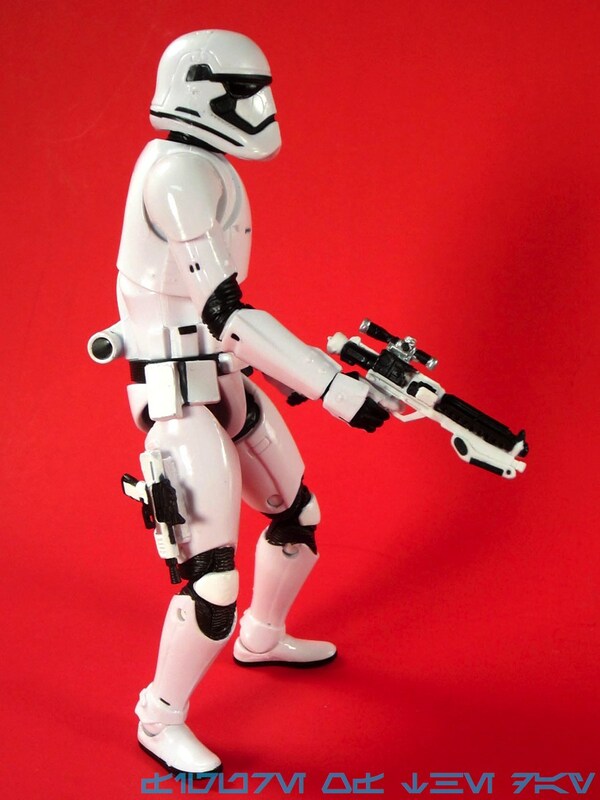 But I digress - this is arguably the best 3 3/4-inch plain Stormtrooper on the market today in terms of looks and functionality, even if the hips look a little weird they do work well. 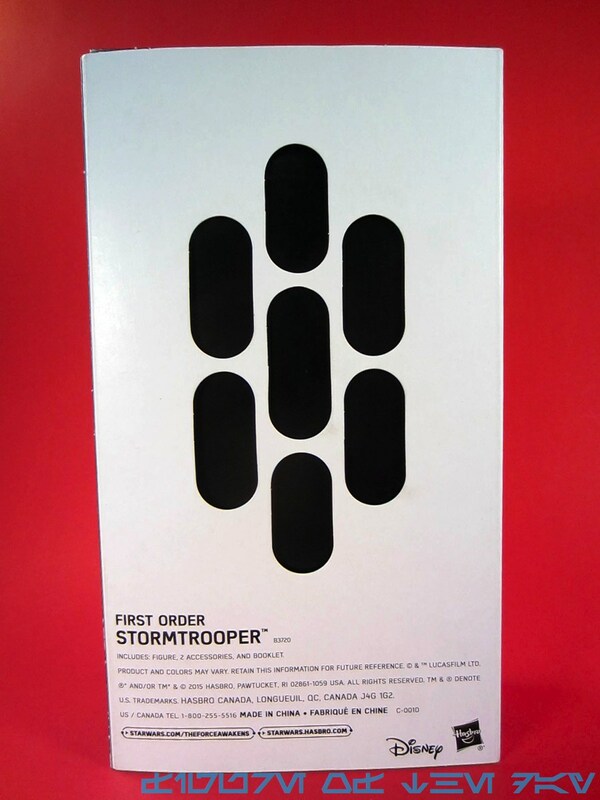 I suspect Hasbro has a better version somewhere in those archives that may some day see the light of day, but until then this one is a worthwhile purchase if you need more troopers. If you don't already know that "new helmet = must buy" for your collection, be happy with the Stormtroopers you have and save your money for the new ones from The Force Awakens. Commentary: Few figures get multiple versions, and fewer still go unreleased. 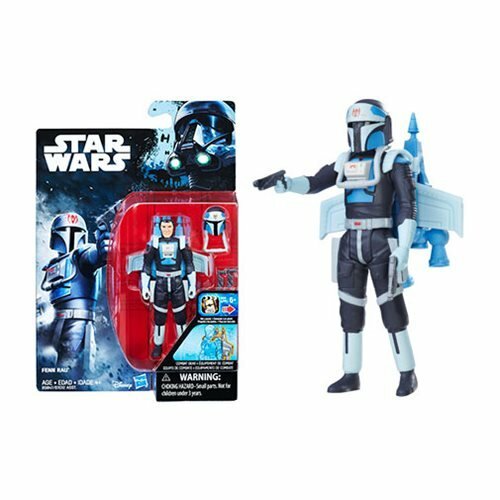 This Captain Rex is in a category with both - it's based on the third season of the Clone Wars redesign, but what's really interesting is a) that outfit got a figure in Saga Legends in 2012, and b) a Phase I armor version of this figure was aborted from a planned release in 2012. 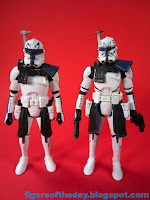 That one was based on the "Clone Captain" (Fordo) figure we know and love, while this one is a different sculpt. 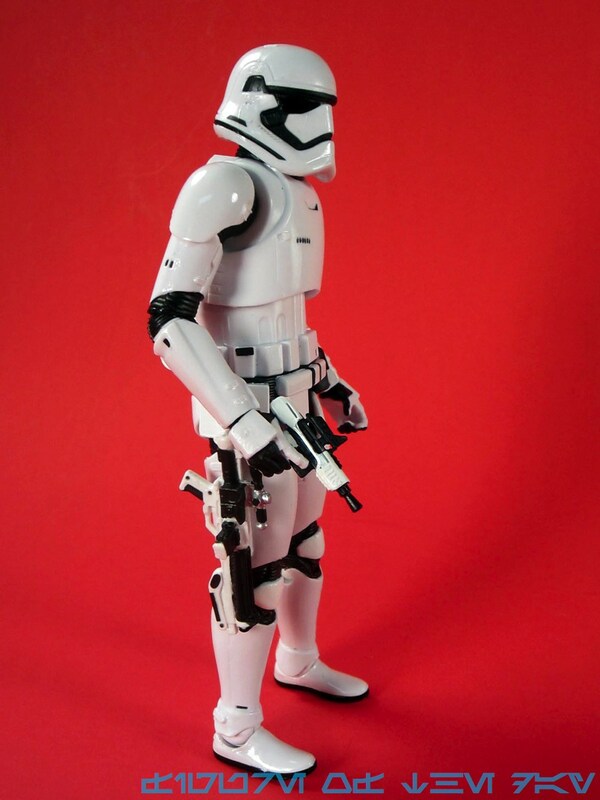 He doesn't have a cloth kama, but he does have holsters for his twin blasters and a helmet that I would say is a bit too tiny given that there should be a human head under there. 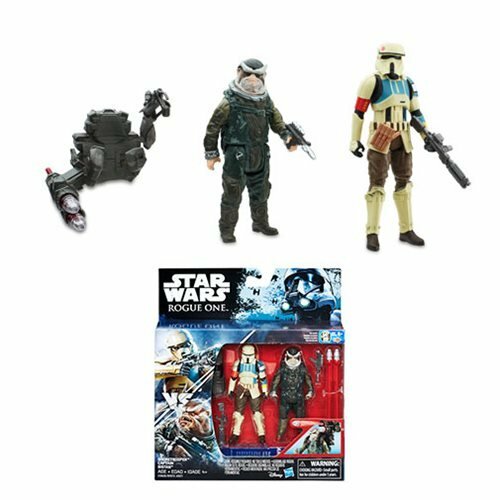 It's still a decent figure, but the Clones of this figure's wave vary in height and size - which is a no-no if you're dealing with Clones. I'm pretty sure it's the first rule of Clone Club - Thou Shalt All Be the Same Height as Jango Fett. The second rule of Clone Club is probably Thou Shall Get Repainted. As mentioned the other day, one of the (un)fortunate things of modern "collector figures" is you know what you should expect - about 14 points of articulation. You'll probably get bend-and-swivel wrists or rocker ankles, but on Rex you only get the wrists. His legs can swing forward so he can sit, or he could depending on where he's sitting - the plastic kama doesn't have much give and could get in the way of some vehicles. Deco is pretty good, but when you apply thick white paint over a dark plastic belt it does sometimes look like he had an accident with the Liquid Paper. That's really all I can say bad about his deco, because it's really good. If you've been with us since 2008 you no doubt have several animated and realistic Captain Rex figures, as well as various ARC Troopers that look quite similar dating back to 2003. If you want more, this is a good one - the metallic bits and the pats that look like they were burned by a torch are really impressive, even if the figure itself could probably have used an extra 11 cents worth of paint to achieve perfection. Commentary: After writing literally thousands of action figure reviews, I very rarely am surprised by Star Wars 3 3/4-inch figures. 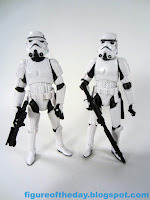 Hasbro has fallen in to a fairly predictable pattern of crowd-pleasing figures with 14 figures and a good sculpt - with many reusing parts whenever possible. Chewbacca was one that surprised me a bit - not only because he had a new head, but because it seems to have really changed up his look and feel. He has really dark brown fur on his thighs, but also the interior of his hands are painted. The bandolier paint is a little sloppy, but it's all silver rather than alternating between lighter and darker ammo packets. Do you know what that means? 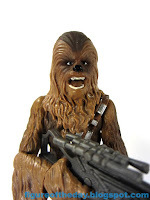 This is the actual update to 1978 Chewbacca. The head is right, the bandolier is right, and it's just a little weird. The eyes are good, the fur on his head is good, and there are no bizarre highlights to weird you out. 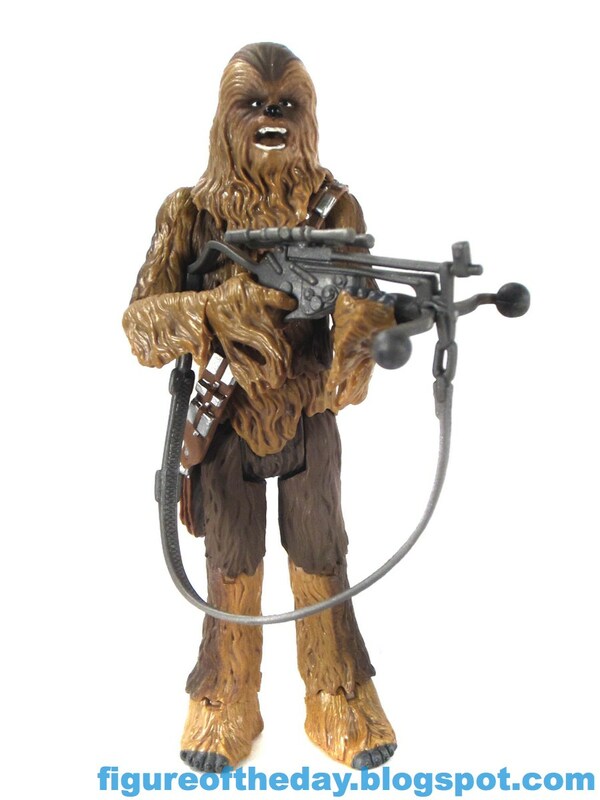 If you're building a display of "the best update" to the original 92 96 99 movie action figures, this should be your go-to Chewbacca. It makes uses of the best-yet body (effectively the 2004 Vintage one) with a new head and new deco. You'll like it. 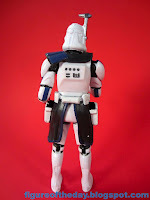 This isn't to say it's perfect - mine had some bandolier slop, and the waist joint is weak. If you make him sit, it's very easy to pop him in half at the middle. It's just as easy to pop the joint back into place, but this sort of "feature" sort of kills the fantasy, given you just killed him. 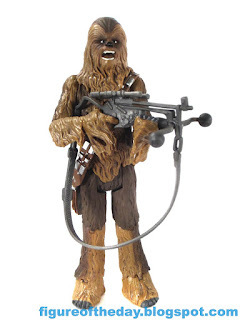 Chewie has no problems holding his weapon with both hands, although the weapon has the little piece in the front that may fall out if you aren't careful. As an advocate of never painting/gluing/changing your figures, I'm considering adding a dab of Krazy Glue to keep it in place. I won't, but I'm considering it. I assume we'll get a better version for The Force Awakens, but as far as "let's update the original Kenner figure" goes this should be one you track down. He looks angry and he doesn't have weird streaks. You're going to have a hard time improving on it, and these little changes shows me that Hasbro really does care about a lot of those strange little details that appeal to older fans. The unfortunate thing for them is that it means I now expect them to do this with more figures. 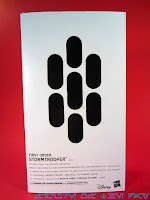 Figures like a Power Droid, or Imperial Dignitary, or Bespin Security Guard. 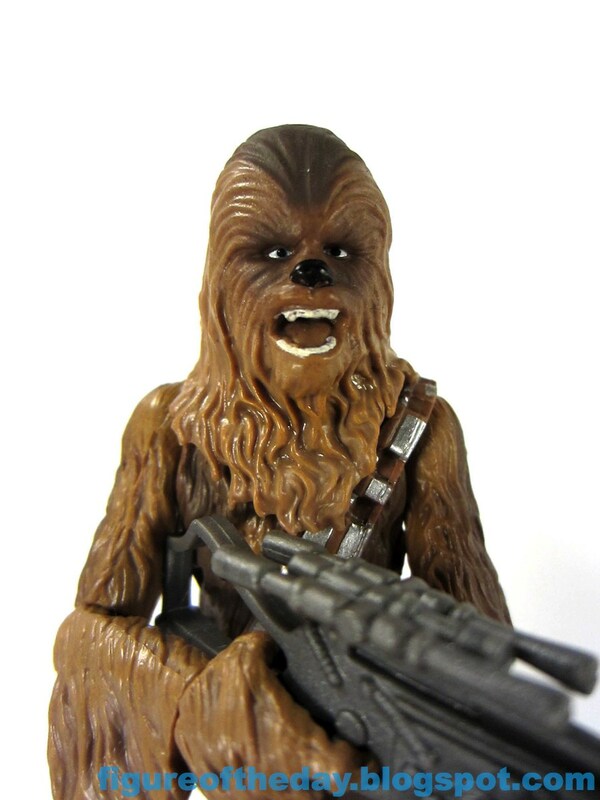 I'm happy with this Chewbacca remake, and now that Hasbro basically nailed it I hope they also do us a solid and retire this body construction as it has provided the basis for multiple Chewbacca toys since 2004. Let's see what's next, shall we? 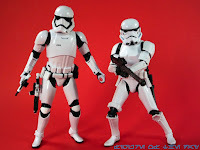 Commentary: As we move along, the number of figures that are genuinely "missing" from the original films dwindles. Remakes of other characters are like the cereal we have to eat before getting to the prizes that are the likes of Mosep Bineed - the first new Cantina alien sculpt since Dr. Evazan's 2012 remake, and the first all-new Cantina alien since 2011. Hasbro is being stingy with these now. Mosep is recognizable to older fans for a variety of reasons. Maybe you saw him on a trading card, or as "Jabba the Hut" in the Marvel comics. The mold lends itself to an awesome quick-and-easy repaint, should Hasbro decide to go in that direction. (Fantastic Comic-Con exclusive, right there. Throw in a blue-faced Takeel.) Fans of the 1990s Expanded Universe may know him as Jabba's accountant, who retroactively stood in for the crime lord on certain occasions. It's a goofy retcon, but that's how long-running franchises deal with continuity errors. Hasbro nailed it. This figure's pretty awesome, going above and beyond what a good Cantina Alien needs to be good. Rocker ankles will amaze you on this 4-inch tall figure, while ball-jointed shoulders, elbows, and knees are more or less normal. 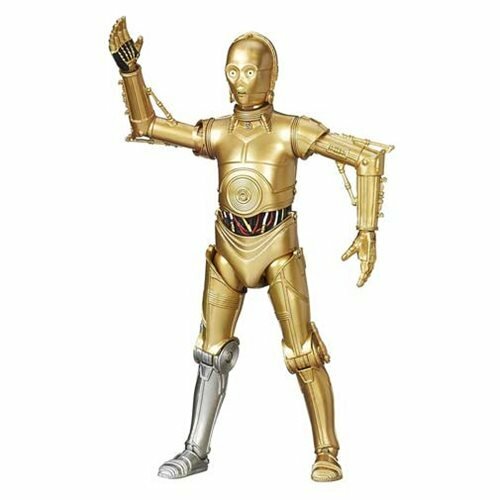 Swivel wrists and a swivel waist are joined by a swiveling neck, making this figure equal to or better than the last few Mos Eisley aliens - and certainly better than the ankle-free Ree-Yees. My only real valid complaint about this figure is the Collector's Dilemma - is it more important to have a super-articulated figure with the "skirt" tunic piece which restricts hip movement and renders a figure unable to sit, or is it better to mar the sculpt a tiny bit to add some cut joints in there so the figure is a worthwhile toy? You know my answer - I think the figure should be capable of sitting - but as the figure is capable of standing upright at a bar, I can't say it's a bad figure. It would be nice to fit him in a vehicle, though. 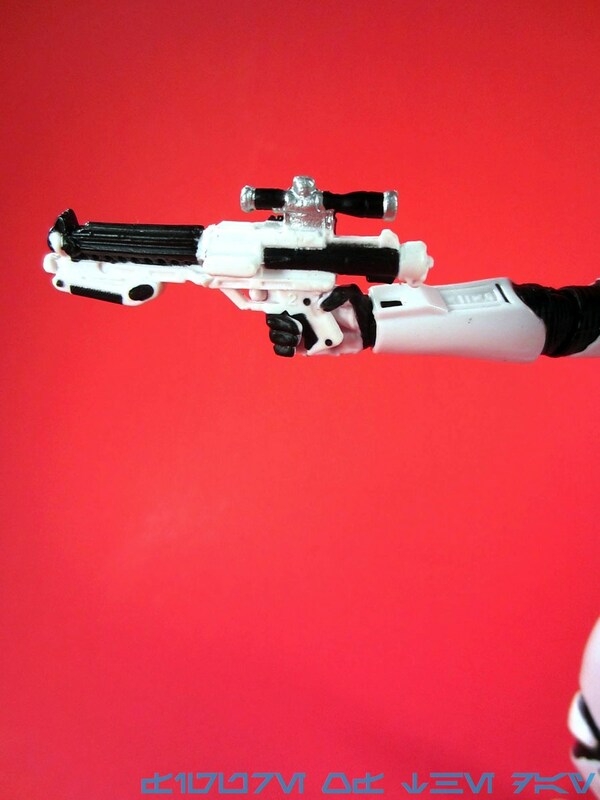 Mosep's tiny blaster fits well in his hand, and his hands may pop off easily - such is a problem with the current construction of figures over the last few years. Don't be surprised if they pop out - but when they do, take a moment to admire the sculpting. The glossy black hands have buttons on the underside of the gloves, painted silver - you may never notice them. 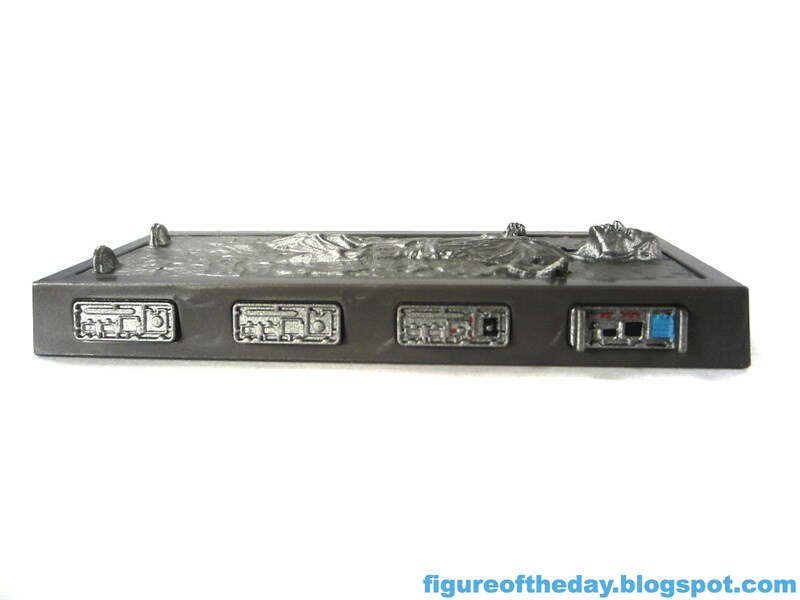 A silver ring is painted on the front, and that should be as recognizable as the silver belt buckle with the little pip next to it - just like your Imperial Officer figures. 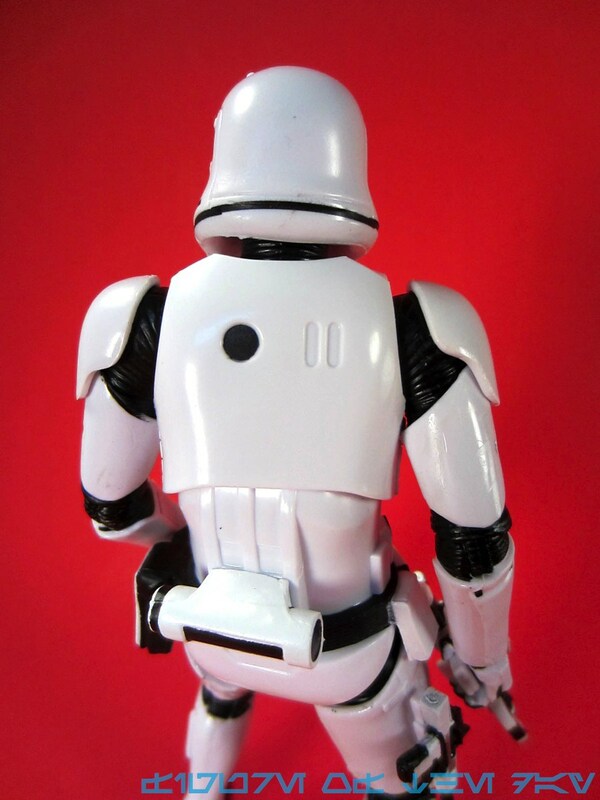 With a different torso, this body would make a fantastic basis for future Imperial Officers, provided you don't need them to sit. The folds in his fabric outfit and the glossy boots are wonderful, and it's nice that Hasbro makes their remaining few aliens excellent as they get made. A long, light grey mane of hair matches what may be the biggest mustache to ever grace a 3 3/4-inch action figure, and his tiny black eyes are expertly painted. When I first read the comic books, I thought "Man, that guy would make a neat figure." I never thought we'd actually get one, and here we are! If you're an old guy, buy this. 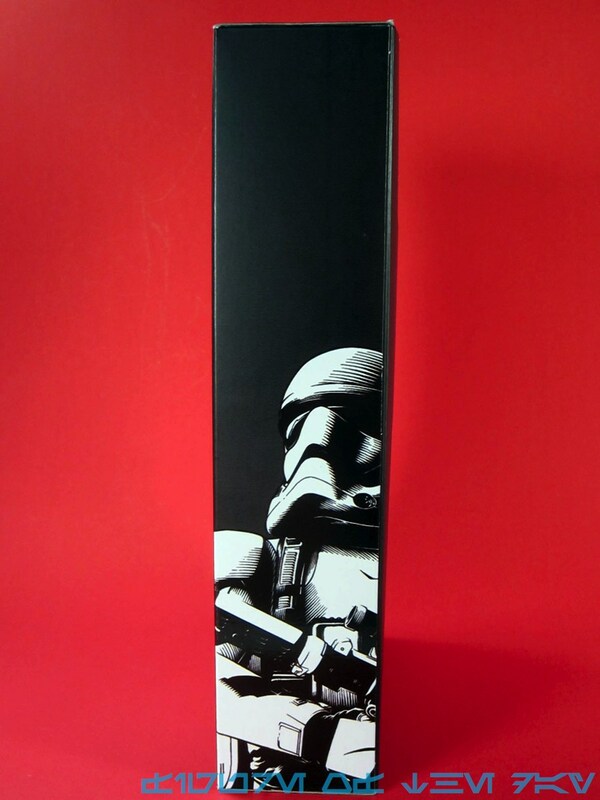 If you're a new collector, start your Cantina collection here. And if you don't know what the fuss is about, you should be similarly put off by the fact that someone has reviewed thousands of these dumb things. 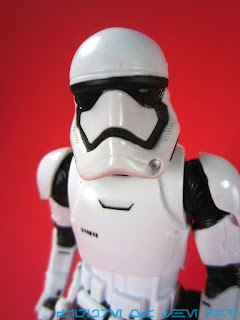 With all the remakes, and the new movies, the days of us getting new-to-toy characters in every wave - or every year - is something we can't count on anymore. It may sound trite, but count your blessings - this is a big one as far as my interests go, and I am happy to finally have a figure I never actually thought I'd get to own. 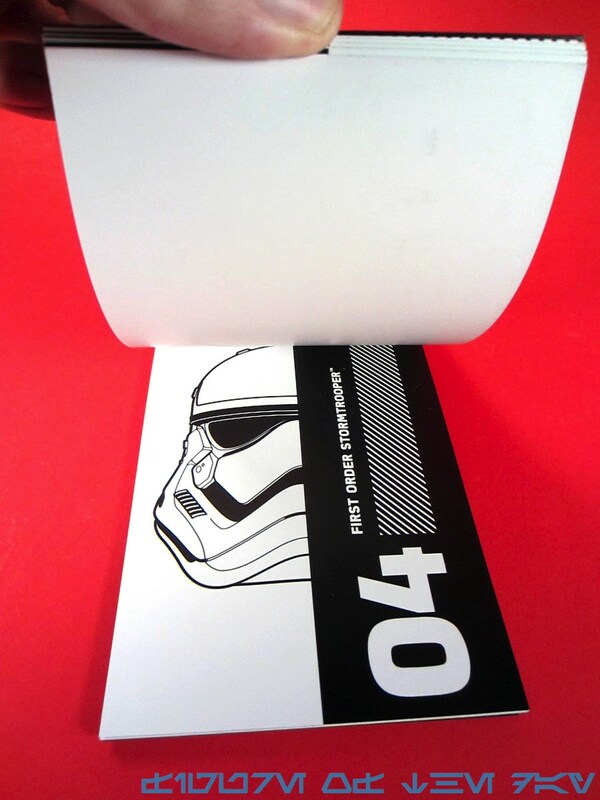 Collector's Notes: I got this online - you can probably score one for $13-$15. Bio: These figures do not have specific packaging or configurations. As such, we will be treating each dome as a unique "figure" as that part is the most plentiful. There were 25 domes in the 2012 series and 25 domes in the 2015 batch so far. 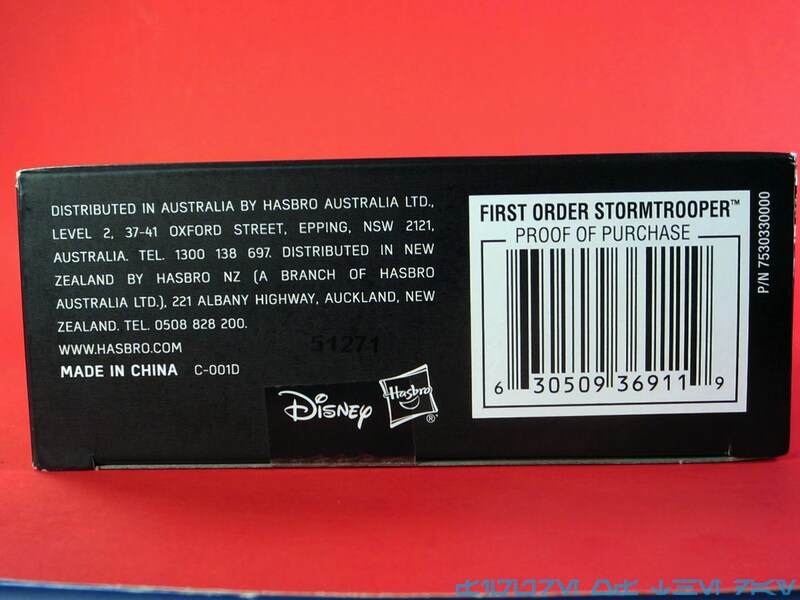 While Hasbro had said they didn't design the first batch, they included Hasbro copyrights. 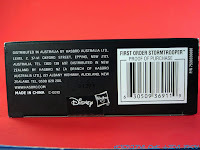 This batch does not - markings read "© DISNEY" and "© LFL" as well as "China" on each leg. 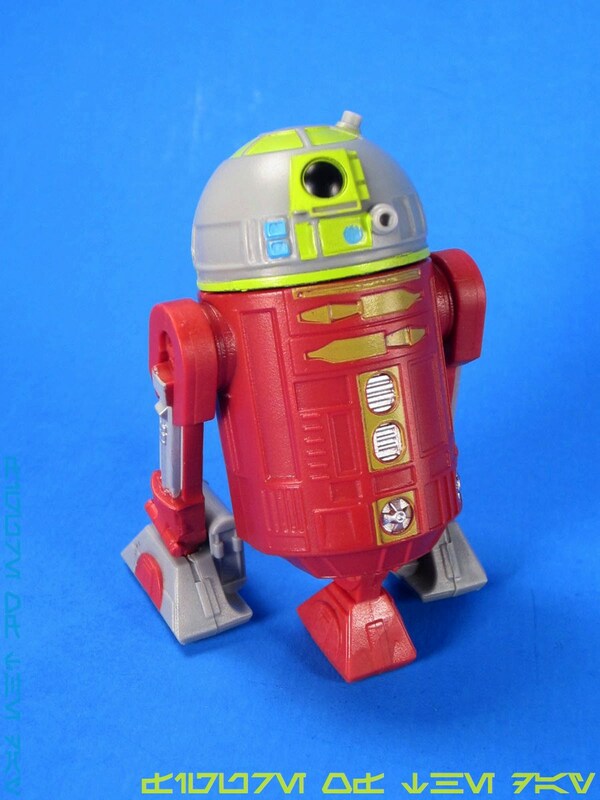 Commentary: This is a "realistic" version of R7-A7, sold as an R2-Series Astromech Droid at Disney parks as part of the second wave. It's roughly the same price as the original animated release on the secondary market. The interesting thing about it from a collecting perspective beyond it being a debut in the "movie" style is that of authenticity. 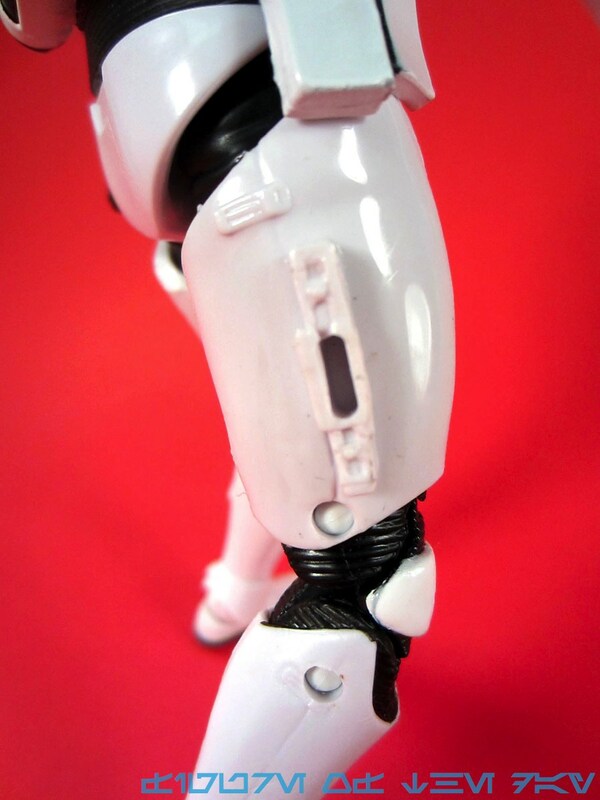 Fans are given a choice - do you use the central maroon color leg to match the body - as this is the only figure that can pull it off - or do you go with the cartoon-accurate grey central foot? That's pretty obnoxious, so maybe be real nice to the people at the parks and they'll let you take both. This little fellow's dome has wonderful light green markings and a pair of light blue markings on his face. The back of the head has a single red box, with most of the various panels remaining in unpainted grey. The central "cap" panel is unpainted and has the hole for a hat that you all know and love. The body of this configuration was retooled. 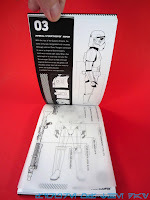 The lower holes on the R2 body were removed, so you can't make a four-armed droid anymore. 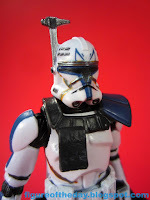 The maroon plastic body has grey and silver markings, and really doesn't work well with any of the other domes. Heck, even with the "correct" parts it's still somewhat weird to look at with the other colors of feet. The back of the body is largely bare, save for two painted silver details. Each leg is new - actually, it's only one leg. Disney had issues keeping enough matching right and left legs during the 2012 run, so I'm sort of happy that they found a clever solution to the issue. Each foot has been redesigned so it's the same on the front and the back. It combines elements from both the front and the back of the feet of the first ones, while retaining the wheels and dropping the wires. As such it isn't perfect, but it's pretty good. This pair of legs is maroon plastic with grey and silver highlights but with grey feet with maroon highlights. I should also note that the arm was retooled so that the "rod" and "dots" on each arm have been removed and the "shoulder" has been smoothed out. It's unique, I'll give it that. The central grey (or maroon) foot for this (and all the other) colors is now unpainted, while the 2012 batch had silver markings around the bottom of the foot. I would assume the foot may be gang-molded with the body, as there are grey bodies as well. There's no real reason to have maroon central feet, so it's sort of infuriating. Do you go for authenticity, or part completism? 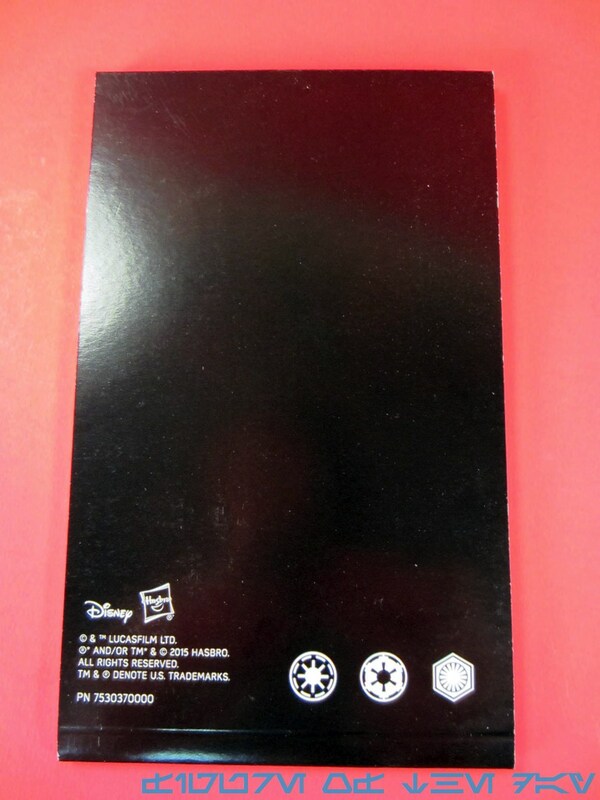 If you got the "Vintage" 2012 Ahsoka, you'll want to get her a droid. 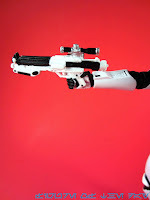 This is it - and man, are we overdoing it on the droids. And I like droids. 25 in a year - over 2 months - is excessive. There's a rumor of a third wave this year and I pray it doesn't come to pass mostly because I'm having difficulty enjoying the ones I've got. I still need to secure R4-D23 and the Holographic R2-D2 this year, in addition to any surprises we don't know about yet. I appreciate this figure ticks one more off the "made in animated style but not movie style" list, of course I'd be willing to bet we will never see all the figures from The Clone Wars in "realistic" style. I like this colorful droid, and if you can swing it I'd say go get it. It's cool. You'll like it. 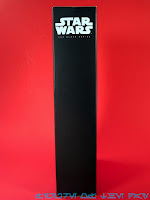 Availability: Get one at Comic-Con, or HasbroToyShop.com next week if you're lucky. Commentary: I was having a hard time with this one. Obviously getting my hands on the new First Order Stormtrooper early is a cause for great celebration, because this is the "sneak preview" figure for the new movie. 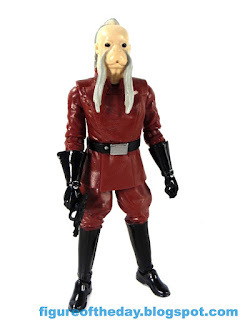 Unless Hasbro has a surprise exclusive assortment that managed to be kept silent - and given the way things have been going, this wouldn't surprise me - here's your only new movie figure until September. 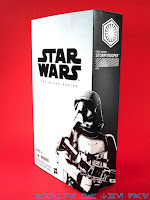 It is expected he will be rereleased with only packaging changes later, making this item most flippable if you're one of those terrible people. If what you're looking for is glowing unlimited praise, I don't believe that I will give it to you - but I can say that this figure improves visually on his troop predecessors while losing a bit of mobility in the process. The look is really beautiful and boxed collectors have a real winner on their hands here. 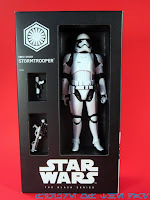 The white plastic deco is so shiny and the silver and black paint details are mostly quite clean. So much so, I daresay I'm taking it for granted. The box retains the bland line name from previous 6-inch releases, but the sleeve and die-cuts reveal some cool stuff. 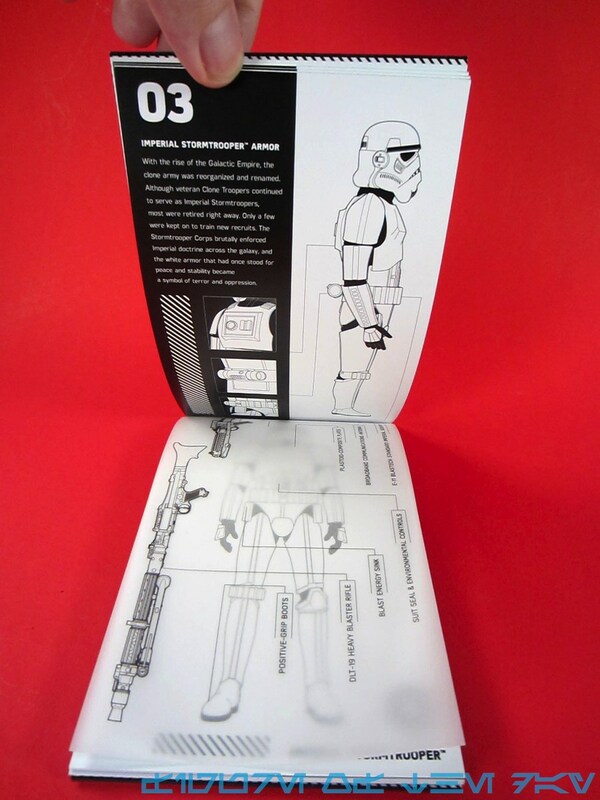 An extended bio on the spine and a booklet seem to hint that someone may have meant for this to be a bigger set with more figures at one point, but we don't know that. 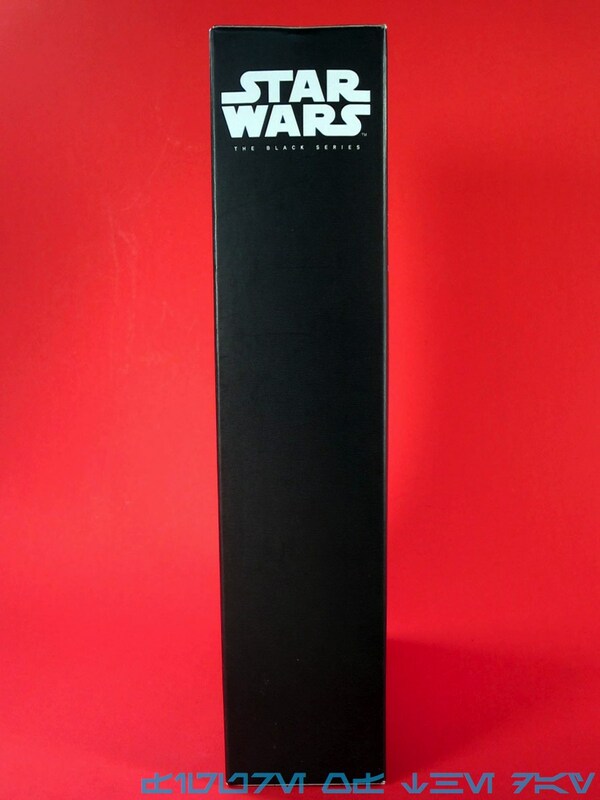 Everything fits together nicely and the package presentation is so good it's kind of a shame that Hasbro won't adopt it for the main line just yet. 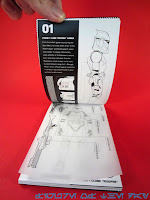 Hiding a little product catalog in the book nook and keeping compartments for the accessories make it feel absolutely wonderful, and if presentation is everything than this figure is, indeed, everything. The reality is that presentation is a good start - the real question you're all asking is what new wonders does this figure have in store for you, right? Here's a surprise - it's a lateral move. Despite heavy advances in articulation with the start of this line in 2013, this figure rolls back a few of them. Wrists turn, and the double-elbow joints we've come to enjoy on troopers have been replaced by a single ball-hinged elbow with limited movement. 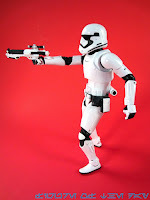 Getting both hands on the gun is a little tricky because you don't get a 90-degree bend on the elbow - it's kind of unfortunate to see troopers, of all things, with less arm movement in a line that is (let's be honest) about collectors posing figures on shelves and never playing with them again. You still get rocker ankles and double knees, though, plus a swell ball-jointed helmet and the wonderful mid-torso waist joint allows for many fun poses. The lack of biceps may bother you, but so far the elbows seem to be mostly doing the trick for arm movement. Except for the wonky elbows. I should highlight that one area Hasbro improved this figure dramatically is in hiding the articulation. I don't think this is going to be immediately obvious to anybody, but the various pins and pegs we've seen before are largely invisible. There are no more white pins in the black body glove regions, and the elbow joints are all internal - so you lose movement, but you improve on looks. I didn't even realize the wrists were bend-and-swivel at first - they managed to cram that part in the forearm, and it really can move in and out a tiny bit. It's easy to lash out on the elbows - I just did, and will do so in the future - but everything else shows evidence of a lot more careful thought and planning than before. The range of motion on most joints is very good, and the figure can even sit on a desk or a small chair with no problems. Seeing how Hasbro usually handles articulation, I think that means they're giving more than a little thought to this mold's future reuse and potentially even more vehicles in this range. My favorite feature of the figure is his holster. Rather than include a black pouch, there's a ridge on the right thigh that has a slot to plug in either of his two guns. 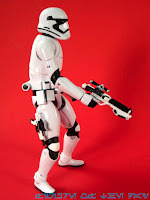 I love it - true to the movie or no, it's just so gosh darned handy to keep the figure with his weapons. He can hold one gun, and store the other. It's brilliant, and a nice piece of relatively simple toy engineering. I haven't even gotten to the design yet. Not being intimately familiar with the final full suit of armor yet myself, all I can say is I love it. When I first saw the leaked helmet design, I was immediately taken with how it looked like it came from Star Wars' future as I might have envisioned it in 1987. This would be right at home adjacent to early Lazer Tag toys, except it's far more interesting to see the changing mouth connect to the eyes with quasi-Alice Cooper streaks down the cheeks. It's much smoother than other designs, with slightly bulkier ankles and various greebles that I assume serve some unknown purpose. There are rods on his shins - why? I have no idea. His belt feels almost off-the-shelf with more visible black on the sides of pouches not unlike the case you use to carry your Nintendo 3DS. You know the one. The back of the helmet is totally smooth except for a black stripe connecting to the front, which is somewhat unsettling. The back of the armor is similarly smooth, with a black dot for the "OII" pattern we've known on our troopers since 1977 forming the focal point on a design that would have been at home in a 1989 Z Gallerie shop at your local mall. (They had lots of black and white back then.) 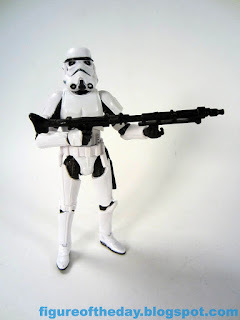 It's really strange to see some of the design choices up close - fingers are black on the outside with white on the inside, and the guns have a ton of white on them. I don't know if this is because of some military combat strategy, aesthetics, or because it makes the toys easier to make if they aren't black in the movies. The design looks very similar to the original rifle, but the smaller pistol doesn't seem overtly Imperial. Maybe it's very First Orderly, I don't know enough about their style yet. 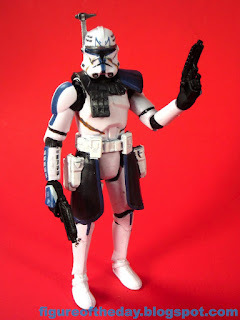 I don't feel inspired to army-build but I do think I'd be happy to see other repaints or disguised characters in this armor if such things make sense as the story is concerned. 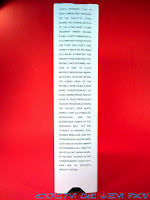 Collector's Notes: I got this one from Hunter PR. 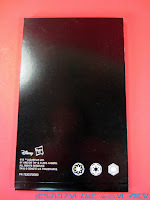 You will most likely get one from eBay, HasbroToyShop.com, or via barter for one of your kidneys.